Spring is here, and the boots are being tossed aside in favor of chic, eye-catching, colorful sandals! But Eek! Winter feet! Socks, cold, and the dry winter air can really do a number on the feet, leaving heels dry and cracked, which means it’s probably time for a much-needed pedicure – before you even think about slipping into those pretty silver high heel sandals! Not everyone has time to go relax in the massage chair and have our feet done while we catch up on the latest Glamour Magazine. In fact, many of us may just prefer to do our own pedicure’s at home and not have to worry about someone else touching, or even seeing our feet given the condition they are in at the present moment! Luckily, it’s super easy to get a luxurious spa-like pedicure right at home! All you need are some good quality products to help slough off the dead, dry, winter skin, and reveal more youthful, super soft, smooth, Sandal-Season ready feet! 1. Start by gently removing nail polish with non-drying nail polish remover. Tip: It’s tempting to buy the cheap drugstore stuff, but your nails will look better and feel much smoother and hydrated if you invest in some good quality stuff from the salon. 2. Soak your feet for 15-20 minutes. It’s ok if you don’t have a foot bath, you can soak your feet in a large bowl while you catch up on Dancing with the Stars, or relax in a nice hot bath. Tip: Add some skin softening bath salts or a bath bomb to help loosen up dry, dead, skin. 3. Dry feet with a towel, and pull out a pumice stone or foot file made for the skin, and start rigorously sloughing off the dead skin. Be sure to not go overboard as you can do more harm than good here. Just exfoliate enough to reveal smooth skin underneath and get rid of anything dry and flaky. 4. Moisturize those feet! Pay special attention to the heels or other dry areas of the feet. Invest in a good foot cream that provides great hydration to the feet. 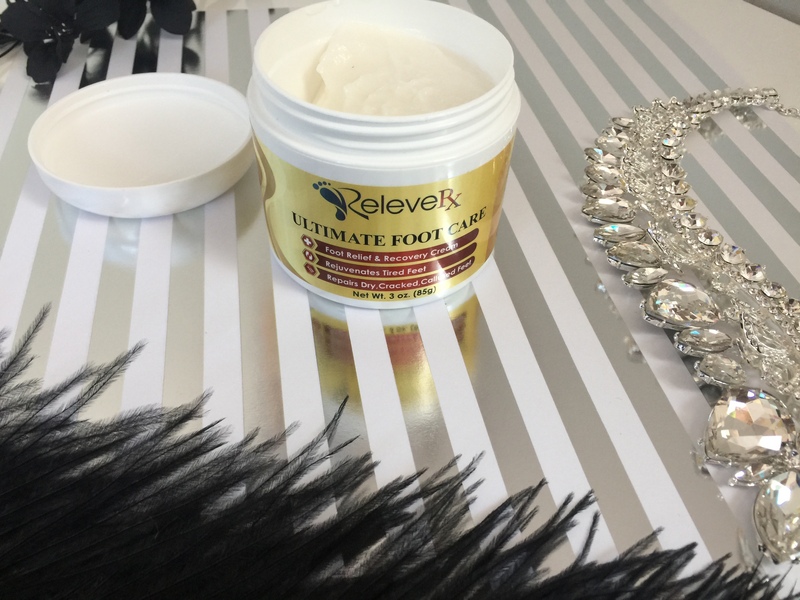 I love using the Releve Rx Foot Care Foot Cream – which not only works as an amazing foot cream for the ultimate pedicure, but it actually heals and repairs feet too! It can totally be used for tired, over-stressed, stiff feet as well! In fact, it works as a pain reliever and reduces inflammation in feet for such conditions as diabetic foot pain, fibromyalgia, and even works great for those suffering from Athlete’s Foot! This foot cream is amazingly rich and creamy and will leave skin feeling super soft and smooth immediately. I also love the soothing peppermint scent! Tip: Still got extra dry feet? Slather this cream onto your feet when you get in bed at night, and wear socks to sleep in. You will wake to incredibly soft, moisturized, super smooth feet! Repeat as often as needed! 5. When painting your nails, always use a base coat to keep polish from drying your nails. Add two coats of your choice of polish, then finish with a topcoat. Tip: Apply polish and base coat on and around the tips of your nails and underneath if you can. This helps nails from chipping. Also, If you just painted your hands as well, use gloves when washing dishes or cleaning in the future, as cleaning agents and dish soap are some of the worst products for shortening the life of your manicure or pedicure. Also, gel polish and a UV Nail lamp are worth the investment if you want to prolong the life of your manicure/pedicure! They are available to buy on Amazon and can be used right at home! 6. Touch up your nails by dipping a Q-tip in nail polish remover and use it to go over and around the outside of nails where paint has gotten on your skin. 7. Finish up with cuticle oil and rub around the cuticles of your hands and feet to help moisturize the skin and prevent hangnails. There you have it! Hopefully armed with these tips, your feet will be ready for Spring and Sandal Season in no time! Interested in picking up some for yourself? Shop Releve Rx Here on Amazon. Also be sure to check out all the reviews while you’re there! I’m not the only one completely in love with this stuff! What are some of your fav tips for a fabulous pedicure? Let me know in the comments, I love hearing from you! Be sure to Follow MyStyleSpot on Instagram and Pinterest to find other fabulous beauty, skincare, makeup, and hair tips! Thanks for the tips! I have never even thought of cuticle oil. I have never used it, but I think I will give it a try! I picked this article on purpose, because I have to take extra care of my feet, because I am a Diabetic. I can’t afford a professional pedicure all the time. I feel really blessed to have all these products available to help. Thank you for sharing! I’m sharing on Facebook.